I had landed at Charles De Gaul Airport in Paris, France and wounded up spending two nights in this beautiful city. I will visit Gilbert Joseph's bookstore where I have a catalog of media being sold, enjoy fine dining and will eventually voyage onto Barcelona in Spain. 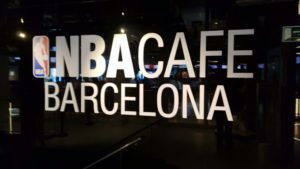 While in Barcelona, I will visit the NBA store along with a variety of record shops and in the midst of all this excitement, all that was in my mind was getting to Italy. 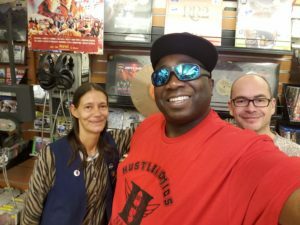 As I walked to the record shops, I kept hearing a line from KRS-One on the 1988 Boogie Down Production's single, I’m Still #1, Where he says “I love to steer the Alfa Romeo from here to there”. 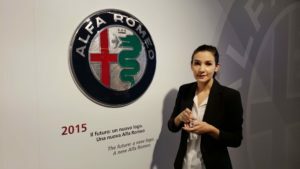 That was my introduction to Alfa Romeo and I have been longing to visit Italy ever since then. That line has stuck with me for the past 30 years, but my love affair with Italy began a lot earlier. As a toddler in Boston in the mid to late 70s, I had an Italian nanny who was like a grand mother to me. She will always nurture me, make me treats and Italian food, and also, she helped me learn how to walk. 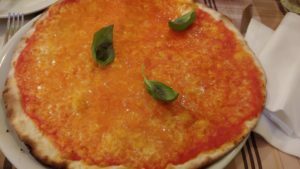 I have a strong affinity for Italian food till this day. I have also been inspired by Italian literature, fashion, and art so I couldn’t wait to finally set foot in Italy, and reconnect with a place that has had such a great impact on my life. Landing in Roma (Rome) was special. I will take a train from the airport to the main city center and as the train whirled by, I would take in the sights of this majestic city. 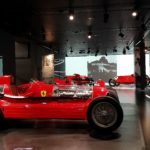 My trip to Italy will include stops to Alfa Romeo and Ferrari, and when I get to the museum in Arese, I will learn that they were linked with Alfa giving Enzo his start in Motorsports and Scuderia beginnings intimately linked to Alfa. 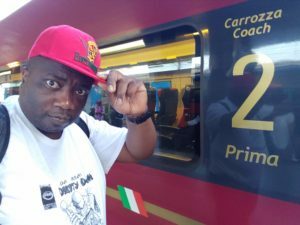 I will ride first class on the Prima Italo train from Roma central and see graffiti on the wall along the way while travelling at speeds of up to 300 km/h. When I arrive in Milano, I will find a gorgeous city that is modern with a mix of traditional Italian architecture. Central station is especially stunning and you can find a mixture of people from all over the world with different cultures and races interacting. 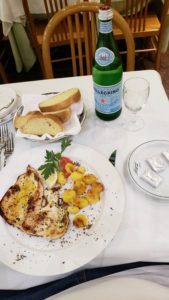 There was so much culture and global influences and I had a nice meal of roasted chicken and potatoes, along with a cannoli for desert. As I ate, I thought fondly of my Nana in Boston who has since passed and wondered how she would have made the dish. 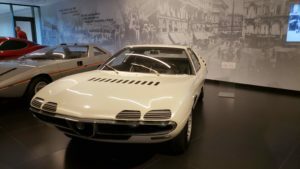 Finally, Sunday arrived and it became time to visit the Alfa museum in Arese. 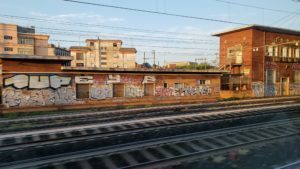 Arese isn’t too far from Milano and I was able to take a train to the Rho Fiera Station. 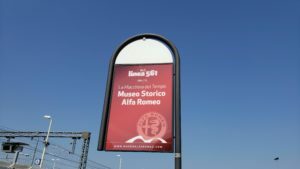 The line 561 bus gets you to the museum from there, however, was on an abbreviated schedule due to August break for workers in Italy. 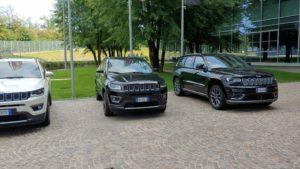 A taxi will get me through the rest of the way and once I arrived, I saw the Alfa Museum, a show room, a café along with a showroom for Jeep on site. 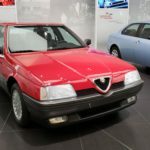 I saw so many gorgeous machines that highlighted how Alfa pioneered Italian design and also worked with the most famed designers like Bertone. I saw the 8C in sculpted form, allowing the appreciation of how elegantly it was conceived. 2600 SZ was also on display along with the Montreal Expo. Several other models were in this display area including the 8C Competizione and the Marquette, and I was certain this visit will be a treat. This was just on the first floor in the main display area and I was fortunate to have a lovely guide through the tour as the whole experience could be overwhelming without someone to give you context and explain the rich history. The evolution of the Alfa logo was intriguing, beginning in 1910 as Alfa Milano. As legend would have it, a young draftsman, Romano Catlaneo said he had been struck by the Visconti serpent seen on the Filarete tower while waiting on the No. 14 tram in the morning. The designer of the first Alfa Model will add the cross, the blue and the gold among other elements. In 1919, Nicola Romeo's name was added to the logo after he completed his acquisition of the entire company. The display will continue through the years till the current version of the logo which was designed in 2015. 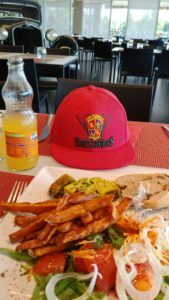 I left with a great appreciation of the heritage and story. In the beginning, Alfa made engines and was known as the automobile of the skies. One of the first engines was the 24 HP Avio which was made in 1910. 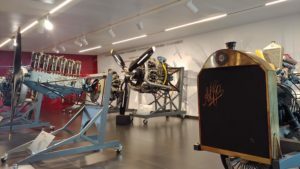 The engine's display room had several engines through 1952’s 121 RC 14. 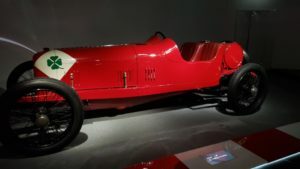 The early Alfa’s were coach builds with the 24HP making its way into the very first car known as the A.L.F.A. 24 HP which was on display in the museum. 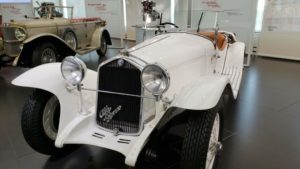 Several other models were fascinating to me, including the RL Super Sport from 1925, The 6C 1750 Grand Sport from 1931, The 1900 Super Spirit from 1954, the Gulia TI from 1963, naturally the Montreal from 1970, The 8C, and of course the 164 3.0i V6 from 1987 which KRS One was probably talking about, along with so many other models than would take me forever to name in this piece. Another fascinating room featured concepts and I learned so much about Alfa design's influence on the entire industry. 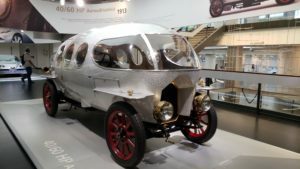 One concept from 1913 was called Castagna and it had the engine in the front in an enclosed aerodynamic design. 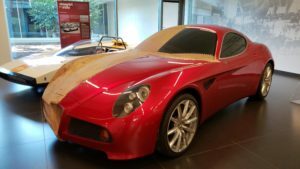 It was a custom build and was designed to be fast, but being enclosed caused a heat issue which lead to the design becoming a convertible. 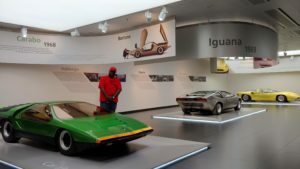 The 1968 Carabo by Bertone reminded me of a legendary Lambohghini from the 80s, the Iguana from 1969 was reminiscent of the Deloria from the Back to The Future movie which makes sense since they were both designed by Giorgetto Giugiaro. Pininfarina designed the 33/2 coupe speciale in 1969 among many concepts that were amazing. The design and concept section is a must see in person. The racing heritage section however was enlightening. 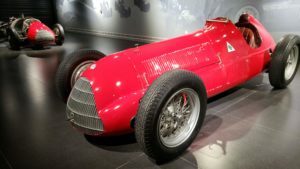 Alfa Romeo won the first 2 seasons of the F1 series in 1950 and 1951, and Alfa literally launched the career of Enzo Ferrari. 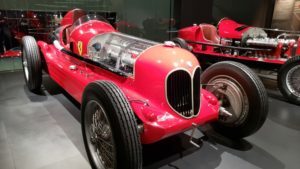 Enzo Ferrari and his Scuderia team will manage the racing activity of Alfa and a twin-engine car with a Ferrari logo spoke of the partnership. Actually, Enzo was initially a driver for Alfa. Other interesting tidbits include the story behind Quadrifoglio. Quadrifolio was originally a luck charm for its driver who received the number 13 in a race and decided to paint a four-leaf clover on the side of his vehicle to give him good luck. He won the race which was called Quadrifolio and from 1933 on, Alfa Romeo will use this logo for their competition cars and high-performance models. 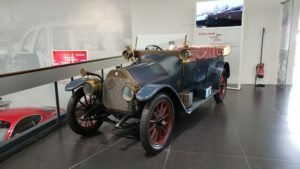 There was so much to see in the museum and I literally spent the entire day there finding time to check out some virtual driving, using an Oculus setup similar to a display we ran at the Washington Auto Show. A 3D movie theater and a café where also there and I had a lovely meal with another vintage Alfa on display. 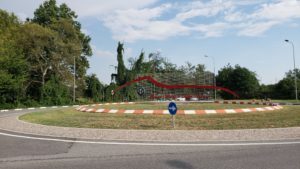 I hated to leave, but I had a date the next day at Ferrari where I will have to travel to Modena in the morning and wind up in Maranello later in the day. 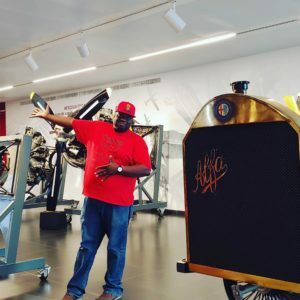 My visit to Ferrari is next in this automobile manufacturing series, stay tuned for, The House of Enzo.